Many graduates of the Onward to Opportunity career training and certification program receive job offers from top companies such as Amazon, USAA and Accenture Federal Services before they leave the military. SAN ANTONIO, T.X., (Jan. 16, 2017) – Eighty-four service members and military spouses from Joint Base San Antonio (JBSA) will start 2017 on a high note as they celebrate the completion of the Onward to Opportunity (O2O) career skills training program with a graduation ceremony, and for many graduates, a new job. The graduates will be recognized on Tuesday, January 17, at JBSA by the Schultz Family Foundation (SFF) and the Institute for Veterans and Military Families (IVMF) at Syracuse University. Over the next five years, more than 1 million military service members and military families will transition from military to civilian life. For many, finding employment will be the most challenging aspect of their transition. 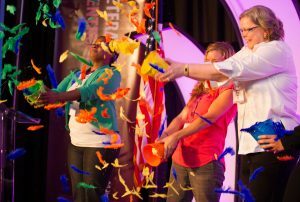 Launched at JBSA in February 2016, Onward to Opportunity was developed by the IVMF and is unique in that it provides job training for transitioning service members and spouses at the installation, before they separate from the military. The program often builds on skills and experience gained in the military, putting graduates on strong footing as they re-enter civilian life and minimizing potentially long periods of job-hunting and unemployment. Onward to Opportunity partners with leading veteran service organizations and private sector companies to identify employers committed to training and hiring veterans and military spouses. These employer-partners assist in curriculum design, interact with participants as they progress through the program and commit to interview opportunities within their company for graduates. Prior to graduation some program participants have already landed positions with companies such as Amazon, Accenture Federal Services, Tyson Foods and USAA. U.S. Army Sgt. Chad Strickfaden, is one of these graduates. He accepted an offer from Booz Allen Hamilton where he’s just beginning a career as a senior network intelligence analyst. Serafina De Los Santos, Executive Director 502nd Force Support Group at JBSA is credited as the driving force behind bringing Onward to Opportunity to the installation. “I am thrilled at the continued success of Onward to Opportunity at JBSA. It is a testament to the generosity and commitment of the Schultz Family Foundation to our transitioning service members. To date a combined total of over 140 transitioning service members and/or family members have taken advantage of this great program to transition with excellence,” says De Los Santos. For more information visit the Onward to Opportunity website. Onward to Opportunity is a cost-free (with no use of GI Bill benefits) industry-focused career skills program that connects transitioning service members, active duty military spouses, and members of the National Guard and Reserve to high-demand careers in customer service and information technology. Delivered by the Institute for Veterans and Military Families (IVMF) at Syracuse University and supported by the Schultz Family Foundation, Onward to Opportunity partners with leading veteran service organizations and private sector companies to connect transitioning service members, military spouses and veterans with meaningful employment opportunities at companies across the country. For more information, visit onward2opportunity.org and follow the Onward to Opportunity on Facebook and Twitter.